1. the part of the upper limb from the shoulder to the elbow; called also brachium. 2. in common usage, the entire upper limb. 3. a slender part or extension that projects from a main structure. brawny arm a hard, swollen condition of the arm due to lymphedema following mastectomy. chromosome arm either of the two segments of the chromosome separated by the centromere. 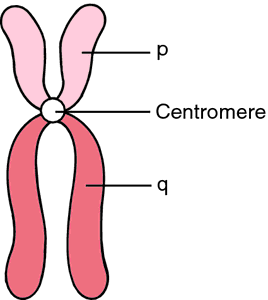 The arms are equal in length when the centromere is in the median position and are unequal when the centromere is off center; the symbol p indicates the short arm and q the long arm. Chromosome arms. From Dorland's, 2000. 2. An anatomic extension resembling an arm. 3. A specifically shaped and positioned extension of a removable partial denture framework. 4. One set of cases or participants in an epidemiologic study, especially a randomized controlled trial, in which comparisons or contrasts are being made between sets. 5. Colloquially, the entire upper limb. 1. brachium; the part of the upper limb from the shoulder to the elbow. 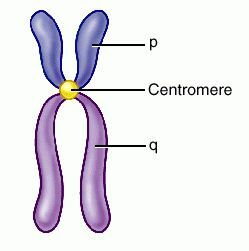 chromosome arm either of two segments of a chromosome separated by the centromere. 1 the portion of the upper limb of the body between the shoulder and the elbow. The bone of the arm is the humerus. The muscles of the arm are the coracobrachialis, the biceps brachii, the brachialis, and the triceps brachii. the arm and the forearm. See also shoulder joint. abbreviation for artificial rupture of (fetal) membranes. See amniotomy. (2) A part of the appendicular skeleton which includes the free part of the upper extremity (pars libera membri superioris [TA]) from the humerus to the finger tips. A sequence of epochs (time intervals) during which treatment is consistent, defining the course of a subject’s participation in a trial. The “side” on which a patient in a controlled clinical trial is placed, which is usually either a treatment/experimental arm, or a placebo/control (non-treated) arm, assigned in a random fashion. Oncology The 'side' on which a Pt in clinical trial is placed, which is usually either a treatment arm or a placebo arm, and assigned in a random fashion. See Control arm, Treatment arm, Q arm. 1. The segment of the upper limb between the shoulder and the elbow; colloquially, the whole upper limb. Synonym(s): brachium (1) [TA] , brachio- (1) . 3. A specifically shaped and positioned extension of a removable partial denture framework. See this page. 1. In anatomy, the upper extremity from shoulder to elbow. 2. In clinical experimentation or research science, a treatment protocol in which subjects are enrolled. 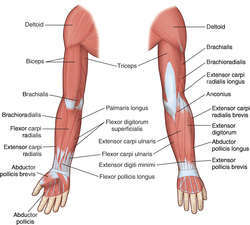 MUSCLES OF THE ARM: Anterior and posterior views. 3. In research on a therapeutic agent, one of several possible interventions. Most clinical trials include an active treatment arm – in which participants are exposed to the agent that is under study – as well as a placebo arm – that is, a sham therapy used for the purpose of contrast or comparison. A jointed instrument used in imaging and in therapeutic procedures (e.g., to permit stereotactic localization of deep anatomical structures; to guide the collection of ultrasonic images; or to focus or direct laser energy). Hard, swollen arm caused by lymphedema after mastectomy. A colloquial term for musculospiral paralysis. 1. A specifically shaped and positioned extension of a removable partial denture framework. 2. In technical speech and writing, avoid using this word in the colloquial sense of 'upper limb.' The segment of the upper limb between the shoulder and the elbow. 3. An anatomic extension resembling an arm. n an extension or projection of a removable partial denture framework. n a body position to be assumed while treating a patient that prevents cumulative trauma to the arm; incorporates proper placement of the wrist, elbow, and shoulder. n a clasp arm used on a removable partial denture to oppose any force arising from an opposing clasp arm on the same tooth. See also arm, retention. n an extension or projection that is part of a removable partial denture and is used to aid in the retention and stabilization of the restoration. See also retainer divet. 1. the limb segment between the shoulder and elbow joints; sometimes called the upper arm as distinct from the lower arm which is the section from elbow to carpus. 2. loosely, the free part of the thoracic limb, especially of bipeds. Q. I have a constant pain in the inside part of my arm. What can it be? In the last few weeks I have noticed that I have a right arm pain. The strange thing is that the pain is in a specific point in the inside part of the arm, very near to the elbow. I thnk the pain started for the first time during a baseball game but I am not sure. I work in a factory and as I sad before I use my right arm for baseball, and this pain hinders me. What can it be? A. I myself play a lot as a pitcher, and i have the same pain. It is more painful when the forearm is flexed towards the body. I went to my GP about it because it drove me nuts, and he said that I need to take anti-inflammatory drugs, and if it will not work he will inject me something. he prescribed me a great medication and I didn't need the injection. walk around town all bundled up and huddled over--our shoulders hunched up by our ears, arms crossed over our chest, and head looking down. The speed and quickness of the sprinter-hurdler is thus dictated by the arm swing and/or positioning. We successfully evaluated the timing model extraction portion of the flow this summer and we are now introducing this flow in our sign-off procedure for use in future ARM projects. When short-term interest rates are low, ARM yields are much higher than many money-market alternatives, such as Treasury bills and CDs. With closer access to the ARM technology we will be able to enhance our research and development activities for ARM-based products. For the purpose of this discussion, we will focus on the muscles that have the most profound effects on arm movement. Dongbu's continuing strategy to offer advanced processes and design support solutions to meet requirements for mobile and portable consumer applications aligns with ARM's commitment to provide silicon-proven IP that addresses critical power requirements for SoC designs," said Brent Dichter, general manager, Physical IP, ARM. Streamlining with flutter kick on back, using right arm (exaggerate 1-2-3 count), then left arm (exaggerate 1-2-3 count) with a slight roll to each side. SPIRIT, a member of the ARM Connected Community, has been chosen by ARM as a preferred software Partner to provide outstanding performance and efficiency to media players and voice-enabled consumer electronic devices. The Seamless hardware/software integration environment provides full control over test execution using the ARM Cortex-M3 processor model, enabling designers to isolate and fix hardware/software interface errors early in the development schedule. To validate MVSIM's capabilities, the two companies successfully collaborated on the verification of a reference 65nm SoC design using an ARM processor and the ARM Intelligent Energy Controller (IEC). Partnering with ARM, we continue to provide our mutual customers with industry-leading processors and proven design methodologies that accelerate the development of leading-edge SoC designs.